Three and a half weeks left, and I am making progress. It is an unbelievable thing that my Typology professor still posted the latest readings on the course website when there is only three meetings left for his class. Wow. Typology really never runs out of material. I solved about 50 percent of my Syntax homework. I then put it aside and finished my reading. Then, right now, I am doing my Semantics homework. I am working on the monotonicity properties of generalized quantifiers. I also scribbled some notes for my Semantics paper while I am in my Bilingualism class. Now talk about multi-tasking. I feel like a juggler balancing multiple objects on top of my head swirling them left and right, up and down, letting them fly in the air. I guess the important thing is that I get things moving, even though it is just a small amount at a time, at least there is progress. If only I had more hands than two. 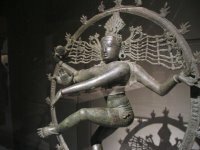 Some along the lines of the Shiva Nataraja. nakakatakot kya yun.... hahahha enlighten me naman what's typology, and semantics? Typology is the sub-field of Linguistics that is interested in the way the 6,000 something languages in the world are different and similar. All aspects of the language are looked at, from the sound inventory, to the way the languages differ in encoding meaning. For example, did you know that the language with the fewest sounds is the language called Rotokas? Rotokas only has 5 vowels and 8 consonants, giving a total of 13 sounds. On the other hand, the language with the most sounds is !Xu (the exclamation mark is the symbol for a particular kind of click sound), found in the Kalahari Desert in southern Africa. They have 47 click consonants, 47 non-click consonants, and 25 vowels. Semantics on the other hand is the sub-field of Linguistics that deals with the study of meaning. This deals with everything connected to meaning, from the meaning of quantifiers, conjunctions, disjunctions, etc. It also deals with how languages encode space, time, force, etc. Knowledge of formal symbolic logic can be of good use here. Anyway, I hope you got an idea of what I am talking about. I hope I didn't fall prey to the KISS Theory, that is, Keep It Simple, Stupid! hirap naman ng course mo LIW. english at tagalog nga lang hirap nang masterin, dami mo pang pinag-aaralan! dapat gawin na lang universal language yung Rotokas para madali. thanx for the effort LIW. really appreciate it. !Xu, i think ive heard it spoken when i went to south africa. we visited this village with all the different south african tribes there. my gosh, i dunno if that was what they were using but they do have the clicking sound which was truly entertaining. I don't think what you heard in South Africa was !Xu. Most of the speakers of !Xu live on the remote Kalahari Desert in northern South Africa and parts of Botswana. Have you seen the movie The Gods Must Be Crazy? The ethnic people featured there are the !Xu speakers, the Bushmen. However, in South Africa, there are languages that borrowed these click sounds and incorporated them into their sound inventory. The most known are the Zulu and the Xhosa. Xhosa has more clicks than the Zulu. Maybe you have heard these, because these are far more common in South Africa than the !Xu. Zulu and Xhosa by the way are two of the 11 (I think) official languages of South Africa.